Turkey has reacted angrily to a US congressional panel's resolution describing as genocide the killings of Armenians in World War I.
PM Recep Tayyip Erdogan said his country had been accused of a crime it did not commit, adding the resolution would harm Turkish-US relations. Ankara has recalled its ambassador to Washington for consultations and says it is considering other responses. The White House had urged against the vote. Armenia welcomed the outcome. The government of Turkey, a key American ally and fellow Nato member, had lobbied hard for the US Congress not to vote on the issue. 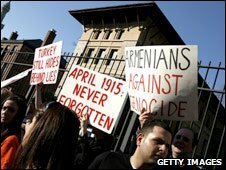 Armenian-Americans have lobbied for official use of the word "genocide"
The BBC's Jane O'Brien in Washington says Turkey must be hoping that, as with a similar resolution two years ago, the issue will not come to the floor of the House for a full vote. In 2007, it passed the committee stage, but was shelved after pressure from the George W Bush administration. The resolution was narrowly approved - by 23 votes to 22 - by the House Foreign Affairs Committee. It calls on President Barack Obama to ensure that US foreign policy reflects an understanding of the "genocide" and to label the World War I killings as such in his annual statement on the issue. Talks between Turkey and Armenia helped defer a US congressional vote after 2007. The two countries signed an agreement to establish diplomatic relations on 10 October 2009 in Switzerland. That deal has since faltered. Turkish PM Tayyip Erdogan has repeated his promise to Azerbaijan not to fix ties with Armenia until the the conflict over the disputed territory of Nagorno-Karabakh is settled. Turkey feels ethnic kinship with Azerbaijan and relies on it for gas supplies. Turkey has also complained about a ruling in the Armenian Constitutional Court restating the requirement to keep seeking international recognition of the genocide. The agreement is still not ratified by either parliament. Both President Obama and Secretary of State Clinton lobbed against the genocide resolution, but only at the last minute. Both supported it as candidates. Turkey may also have lost support from the powerful US Israeli lobby because of PM Erdogan's verbal attacks on Israel. 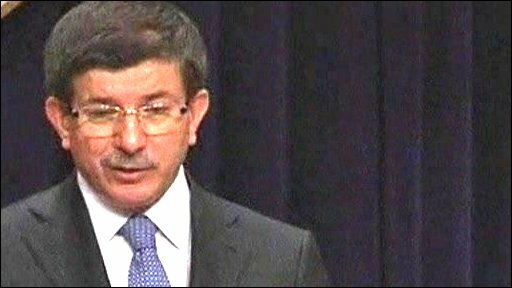 Turkish President Abdullah Gul responded angrily to the committee's vote, saying it was "an injustice to history" to take such a decision with "political concerns in mind". "Turkey will not be responsible for the negative results that this event may lead to," he said. Foreign Minister Ahmet Davutoglu told a news conference in Ankara on Friday that Turkey was determined to press ahead with efforts to normalise relations with Armenia. However, he said the ratification by parliament of peace accords signed with Armenia last October was in jeopardy. A Turkish parliamentary delegation had gone to Washington to try to persuade committee members to reject the resolution. Turkey accepts that atrocities were committed but argues they were part of the war and that there was no systematic attempt to destroy the Christian Armenian people. The Armenian government welcomed the vote, calling it "an important step towards the prevention of crimes against humanity". US Secretary of State Hillary Clinton had urged the House committee not to vote on Thursday on the grounds that it would damage reconciliation efforts between Turkey and Armenia, and said she hoped it would go no further. Media ask: What next for vote? "We do not believe that the full Congress will or should act upon that resolution, and we have made that clear to all the parties involved," she said. During his campaign for the 2008 election, Mr Obama promised to brand the mass killings genocide. Mrs Clinton acknowledged his administration's change of opinion on the issue, saying circumstances had "changed in very significant ways". In October last year, Turkey and Armenia signed a historic accord normalising relations between them after a century of hostility. Armenia wants Turkey to recognise the killings as an act of genocide, but successive Turkish governments have refused to do so. 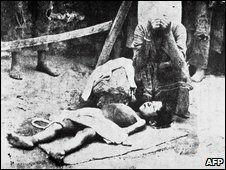 Hundreds of thousands of Armenians died in 1915, when they were deported en masse from eastern Anatolia by the Ottoman Empire. They were killed by troops or died from starvation and disease. Armenians have campaigned for the killings to be recognised internationally as genocide - and more than 20 countries have done so. Head to head: Was it genocide?